This is a continuation of a series of posts on the Nikon D850. You should be able to find all the posts about that camera in the Category List on the right sidebar, below the Articles widget. There’s a drop-down menu there that you can use to get to all the posts in this series; just look for “D850”. After two months of effort, about a 1000 lines of Matlab code (I still think of one k-loc (pronounced “kay-lock”) of code as half a box), and tens of thousands of test exposures, I’m ready to summarize my findings on the accuracy of the autofocus in the D850. It’s not that I’ve run out of things to test; on the contrary, there are many more lenses I could try and a few more things I could vary. However, I’ve gotten to the point where I think more testing will offer diminishing returns, and I’m ready to move on. In addition to this post on the D850, I hope to have another on the Sony a7RIII, and a third comparing the two cameras with respect to autofocus accuracy. For the last month, I tested by directly measuring the location of the plane that the autofocus system selected by using a checkerboard ramp and a computer program that I wrote to analyze the captures. I consider this work more reliable, more repeatable, and more detailed than my earlier MTF-based measurements. The D850 offers two entirely different autofocus systems. 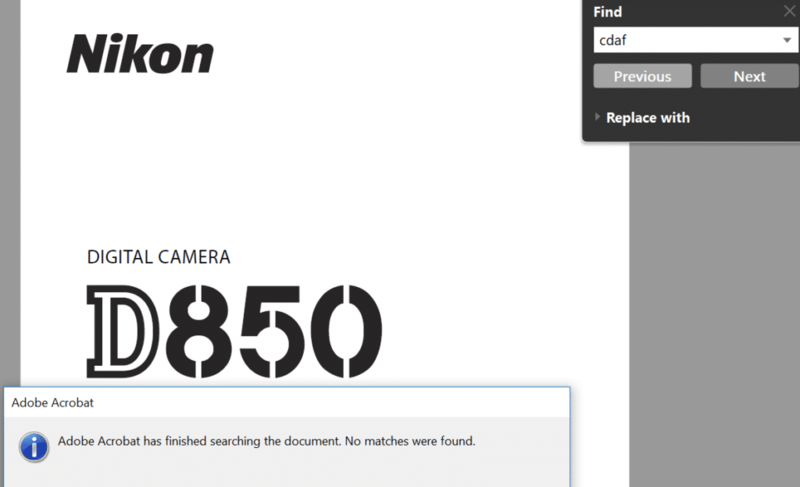 If you’re using the finder, you get phase-detection autofocus (PDAF). In live view, the camera uses contrast-detection autofocus (CDAF). PDAF works with the lens wide open, and CDAF operates at the taking aperture. A few words about measuring focusing errors. First, let’s define a focusing error: it is a departure of the plane of focus selected by the camera from that intended by the photographer. The occurrence of a focusing error does not mean that the overall picture is any blurrier than one with no error. It simply means that the sharpest part of the picture isn’t where the photographer intended it to be. For most of my testing, I used spot AF on a flat target normal to the lens axis, so the “intent” is clear. There are three ways to quantify the location of the actual plane of focus in relation to that intended. When you’re evaluating the CoCs and trying to get a handle on how they’d impact your own personal photography, one yardstick to keep in mind is your camera’s pixel pitch (the spacing of adjacent rows and columns on the sensor). That is usually about 5 um (4.3 and change for the D850, and about 5.3 for the GFX-50s). In reporting my results, I refer to the average error as the mean error, or just mu. The standard deviation I call sigma. Okay, let’s dive in. I’ll deal with CDAF first because it’s simpler. I only tested CDAF in AF-S mode. I’m not even sure it works in any other mode. Since it only works in live view, I think it is natural to use it in AF-S.
CDAF is on average quite accurate, producing circles of confusionwhose diameter is well under the pixel pitch of the D850. You can see that the mean CDAF errors are under one D850 pixel pitch. Now on to PDAF. Since in the D850, PDAF takes place with the lens wide open and the PDAF sensors looking at one or two (fixed) effective apertures, that means we have to deal with focus shift, a phenomenon caused by over- or under-corrected spherical aberration making the plane of sharp focus shift as the lens aperture is changed. 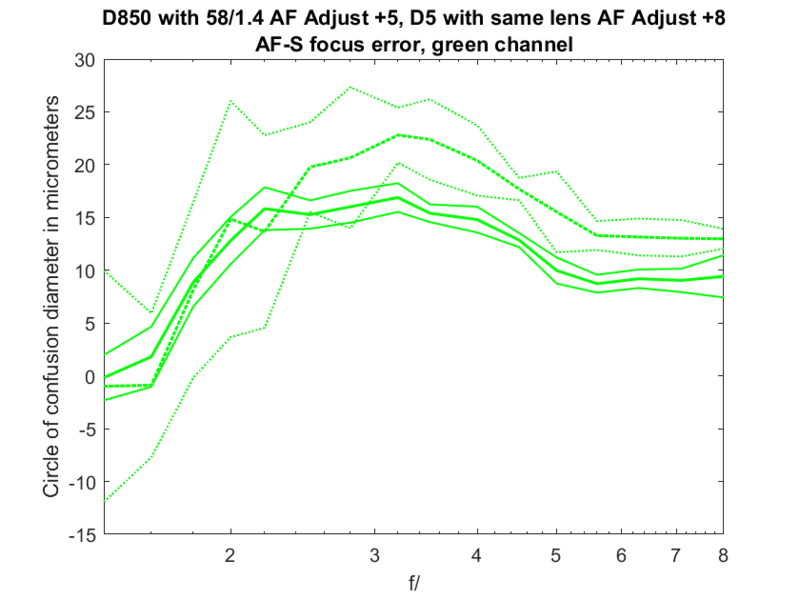 The lens in the above plot suffers from focus shift., which causes the systematic errors as the lens is stopped down on the PDAF (solid line) curves above. Hold that thought. The D850 offers no adjustments for biasing CDAF. That’s because the way that CDAF works, there’s no way to conveniently do that. Fortunately, by and large, CDAF doesn’t need such corrections. PDAF is different: it is both possible and necessary to bias the way the system operates. Nikon provides 21 different bias settings: the signed integers from -20 through 20, with a default of 0. Each step moves the image-field focused plane about 4.5 um. Let’s get one thing out of the way about what Nikon calls AF Adjustments. Unless you are quite tolerant of blurry images — and, if you are, why did you buy a D850?, you should not ignore the AF Adjustments. It is true that 0 is often a reasonable compromise setting, but a) you can’t count on that, and b) your usage of the lens may affect how you want to make the AF adjustments. Let’s explore point b) a bit. Optimum AF Adjustment varies by camera. Put a lens on your new D850. Calibrate the AF adjustment. Then put the same lens on a D5 or another D850. The correct setting will probably be different. Calibrate two lenses of the same model number on the same camera. You will likely find that different AF adjustment settings are needed. This is a focus shift issue. If you have a lens that doesn’t exhibit much focus shift, like the Nikon 200 mm f/2 VR I that I tested, you can probably ignore it. But with the 70-200 mm f/2.8 E FL above, you clearly can’t unless you’re willing to accept blur circles at the intended focal plane of about three pixel pitches. And there are many more lenses like the 70-200 than are like the 200/2. This is probably just because focus shift varies with distance, but there may be other things in play here. It is particularly hard to deal with because none of the lens calibration tools that I know of work at long distances. If you’ve got a zoom, you can’t count on the same AF adjustment value working through the entire focal length range. You may want to pick a compromise setting that is not particularly good for any one focal length but optimizes the range that you intend to use. My testing indicates that this is a minor effect in the normal photographic lighting range of 3000 degrees Kelvin to 6000K, but I include it for completeness. It may be a big problem in extreme cases like stage lighting. You need to take many samples when calibrating the AF adjustments. 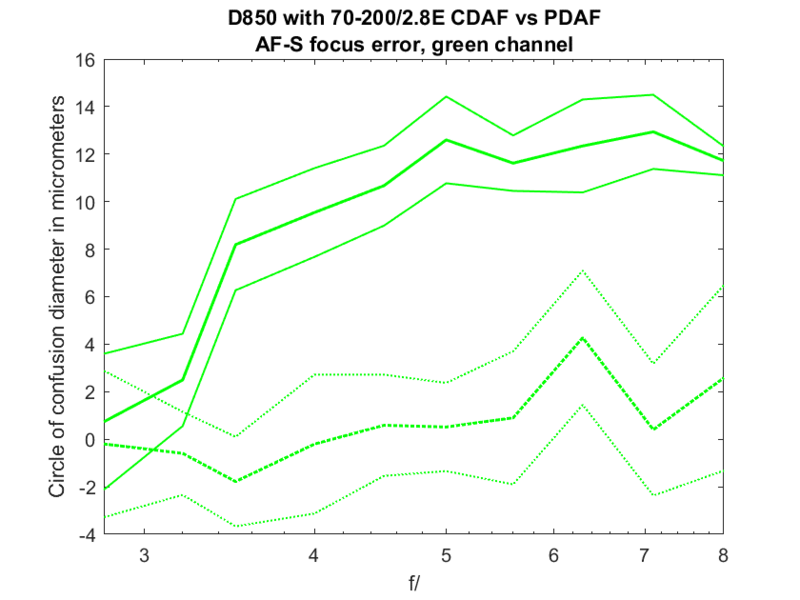 PDAF, and indeed, most any autofocus system, has enough variability that you need to make many measurements and average them, possibly after removing outliers. This is true no matter what toolset you use for calibration, even (actually, I think it’s especially) the tool built into the D850. With the D850 and when using PDAF, the camera does not attempt to correct for focus shift. Take lots of pictures, and cherry-pick in postproduction. In this case, the variability that is part of the AF experience is probably your friend. Even if the mean is off, you can be sure that you’ll get many images that aren’t focused there. I recommend Fast Raw Viewer for culling. Show some flexibility in evaluating the position of the sharp plane. It may not be just where you wanted it, but is it something that you can accept? Remember, focus errors don’t necessarily mean everything is fuzzy, they just mean the sharp point isn’t where you planned it. Stop down a bit. I can already hear the screams. Some of you are already heating up the tar and unbagging the feathers. But this is your single best defense against AF errors and makes it much easier to find god compromises when you tune AF adjustments. And tell me the truth: aren’t you starting to get bored with portraits that only have part of one eye sharp? If your situation permits and your subject is fairly bright, switch to live view, don’t stop down past f/8 or f/11, and you’ll have more accurate results than with PDAF, and you won’t have to worry about how well you tuned the AF adjustments. Thanks for the “executive summary”. Well written, even if I am not the right person to judge. Nice to use f/8, because it masks focusing error. Nice to have high resolution, but hard to make best use of it. It was a bad surprise to hear that Sony A7rII/A7rIII does not adjust CDAF at stopped down aperture. (*) Jim shares all his research free for all. Also, it comes with no strings attached, as far as I know. Science at it’s best! Great summary Jim. What’s interesting is when you consider what may be behind PDAF’s precision issues. Many might attribute it to focus motor precision but the evidence suggests that variance in the measurement of phase differential may be the culprit. For example, if one tries to use the D850/D500’s Auto AF tune feature they’ll find that the camera generates different suggested values for the same locked focus position – those values are calculated from the measured phase differential, the same as what drives the rangefinder indicators in the viewfinder (and the same as what drives the AF system itself). The workaround for that is to take multiple Auto AF tune samples and then average them together. Perhaps the workaround for PDAF variation then is for the camera to take multiple phase samples prior to engaging the AF. These samples can likely be performed very quickly, although it’s unclear over what period of time you’d need samples to offset the original source of the phase measurement variance. Either way, it would be nice if DSLR makers added a “high precision” mode, which allowed the user to trade focusing precision for speed, assuming this theory has any merit. So what’s her face over there at DPReview that photographs skaters is…. how do I put this nicely….. I have deep respect for Marianne, and she double-checks before posting. I would hesitate to say that Marianne is incorrect about anything without a lot of research. Note that she said “some”. Hard for me to disprove that. You’re reporting on two cameras that supposedly compensate for focus shift: Nikon D850 and Nikon D5. Who says that the D850 compensates for focus shift? However, for the D810 and in a more general form only as in “released in 2014 onwards”, citing Marianne with links. So, results may depend on the exact firmware tested. Well that’s not being a curmudgeonly engineer! I have a d850 and shoot sports with the 70-200 2.8 FL. I’ve found that ~1/100 pictures the camera freezes when I’m trying to autofocus and essentially wont do anything for 3-4 seconds after which it then focuses and releases the shutter. It is very noticeable and for sports causes me to miss the particular moment. I use backbutton autofocus, have VR turned off, and the camera set to release+focus. Did you see anything like this in your testing? There is dpreview thread on this now: https://www.dpreview.com/forums/thread/4232068. I haven’t seen that. I don’t use BBAF. I don’t use the D850 for sports, preferring the D5 or a9. For fellow readers: Jeff found out that he accidentally pressed the lens release button.